The French fashion house headed to the Cuban capital, Havana, for its latest fashion show. It was the first fashion show on the island since the communist revolution in 1959. The guests were treated to a long week-end of activities leading to an outdoor show on Havana's Paseo del Prado. The show ended with a conga line of dancing models and fashion figures. Everything was easy to follow since many of the guests provided us with real-time Instagram updates. Cuba has this cachet that screams fashion. From the vintage convertibles, to Hemingway's house, the authenticity of the island seems like a natural fit for Chanel. 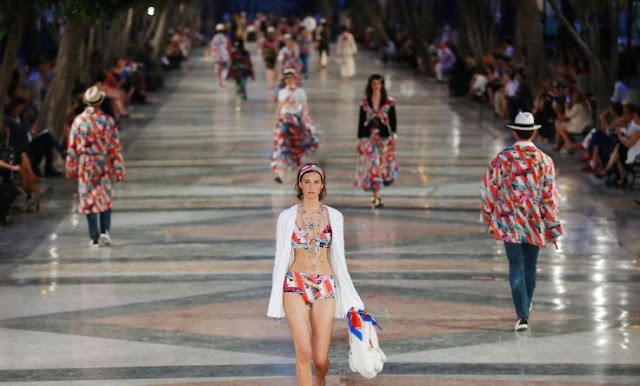 It was also a show of firsts, since on top of being the return of fashion to Cuba, it was also the first time Chanel headed to south America for a runway event. Karl Lagarfield said Chanel's new line was inspired by Cuba's cultural richness and it definitely shows. Cuba for Chanel was a bold choice and it's refreshing. Cuba is open again, and the French luxury brand wasn't afraid to be the first to give the island some fashion exposure.